Is Geothermal Right for Me? Ductless air conditioners and heat pumps provide versatile heating and cooling options for many applications. Whether your home needs a supplemental solution for hard to heat and cool areas, or you’re looking to condition an addition or sunroom both Bryant and Mitsubishi have excellent solutions. As a Bryant Factory Authorized dealer and a Mitsubishi Diamond dealer, Bryant Lincoln has the expert knowledge needed to find the solution that best fits your needs. Mitsubishi Ductless mini-splits offer the best and most proven ductless heating and cooling technology today. With systems that reach efficiency nearly double that of many traditional air to air system and the ability to be split up to eight times Mitsubishi is simply a great solution for any space. Mitsubishi are extremely efficient heating at 100% heating capacity down to -15°F. With Mitsubishi Ductless i-see technology conditioned air is directed in the area most needed. Bryant Ductless mini-splits have made leaps and bounds in the quality offered to customers. 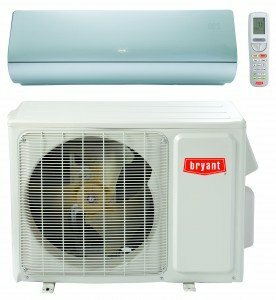 Bryant offers various efficiency options with maximum comfort provided with the Bryant’s Evolution line. Bryant Ductless systems are very comparable to Mitsubishi heat to 75% of capacity to -22°F. We have always been happy with Bryant Service. Thank you so much for everything you did for the Indian Center. Service was quick and courteous and good about coming in an emergency. They did an awesome job. Great workers! Glad to have my bathroom functional again. What a great company! The plumbing department was very professional and completed as promised!